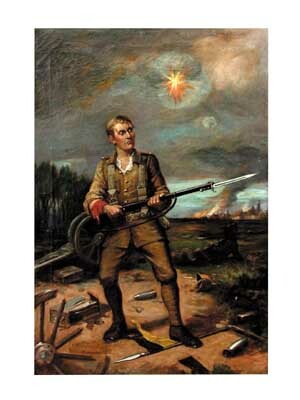 Beautiful antique oil on canvas portrait of a "Soldier at Battle" after H. Cazon Woodhall. This painting is unframed. Items Similar To "77.4425 Soldier at Battle 19th century oil on canvas"
19th Century Oil on Canvas signed Lambert, "Woodlands Scene"
19th Century Oil on Canvas by Orson Bell, "Seascape with Sailboats in the Background"